BOSTON – The hockey world is a small community. Scott Young’s playing career is living proof of that. He played for Jack Parker at Boston University. Ben Smith turned Young from a forward to a defenseman with the 1988 U.S. Olympic Team. He played with and against Ron Wilson as a member of several celebrated U.S. squads. And he crossed paths with legendary NHL linesman Kevin Collins during his 17 year NHL career. And now the man from Clinton, Massachusetts, will meet up with everyone again tonight in Boston when they enter the U.S. Hockey Hall of Fame as the Class of 2017. The ceremony taking place inside a packed hall at the Westin Waterfront Hotel will be a celebration of New England hockey as fans, friends and former players and teammates will all come together to honor some of the biggest names in the game. Joining them will be former USA Hockey Executive Director Dave Ogrean and longtime volunteer and administrator Peter Lindberg, who will each receive the Lester Patrick Award for their service to the growth of hockey in America. The depth of hockey history has benefited youth hockey throughout the years and this year's class is no exception according to Kevin Kavanagh, executive director of Mass Hockey, a USA Hockey affiliate. "From players to coaches to officials to administrators, this group embodies the dedication and leadership that makes our sport so special," Kavanagh said. "It is my hope that the next generation of leaders in Massachusetts look at this group and those that have come before them and value their lessons and leadership." Collins, a native of Springfield, Massachusetts, will become only the second official inducted, joining the legendary Bill “The Big Whistle” Chadwick, who was enshrined back in 1974. Known for his integrity, athleticism and strong skating ability, Collins’ NHL career spanned more than 2,000 NHL regular season games over the course of 28 years. He also worked 296 playoff games, including 12 appearances in the Stanley Cup Finals. He also worked four Canada Cup tournaments, the 1996 World Cup of Hockey and the 1998 Olympic Winter Games. Beyond his service as an on-ice official, Collins was a pioneer in the development of officiating as a whole. He volunteered countless hours to amateur hockey both in his home state and on a national level, coordinating free officiating workshops throughout New England while helping to create its Officiating Summer Development Camp program and its officiating manual series, both of which remain in use today. By the time Parker retired in 2013, he had coached his alma mater in 1,484 games, winning 897 of them, including three national championships, 11 conference titles and 21 Beanpot Tournament crowns. He also helped develop a lengthy list of NHL players and 24 Olympians, including Jim Craig and Mike Eruzione, who played starring roles with the 1980 U.S. Olympic Team. “It’s an unbelievable, humbling experience to go in with these guys. I think it will be a great night,” Parker says. For his part, Smith spent most of his coaching career working with men’s teams in both the international and college ranks, including nine years as Parker’s assistant at BU. As a change of course, Smith was tabbed to serve as head coach of the U.S. Olympic Women’s Team, leading the way to the first gold medal in women’s hockey at the 1998 Olympic Winter Games. He would also coach the squad to silver in 2002 and bronze in 2006. “You never think about something like this when you’re a 12-year-old kid out on the pond,” said the Gloucester, Massachusetts, native, who continues to work with USA Hockey in assessing talent for future national and Olympic teams. 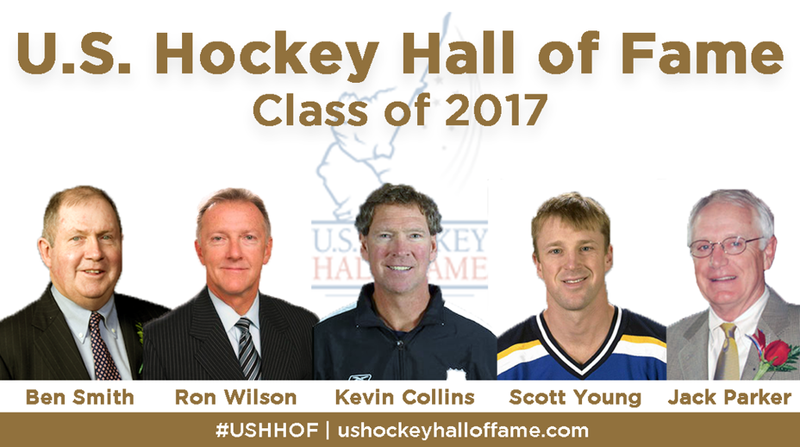 For Wilson, the call announcing his induction came as a surprise, mostly because he was already in the Hall as a member of the U.S. squad that won the inaugural 1996 World Cup of Hockey. But his accomplishments over the course of a long and distinguished coaching career was more than enough to punch his ticket into the Hall. “It is certainly a pleasure knowing that I finally got inducted based on my own accomplishments as a player and a coach,” said the man who amassed 648 regular-season coaching victories, in addition to 48 wins in the Stanley Cup playoffs. On four occasions, Wilson piloted his teams to more than 100 regular-season points. He currently ranks No. 10 among all NHL coaches in career victories, having served as head coach with Vancouver, Anaheim, Washington, San Jose and Toronto over 15 full seasons. While his NHL accomplishments are enough to earn him a Hall pass, it was his work on the international stage that propelled Wilson to even greater heights. In addition to leading the underdog Americans to victory in the inaugural World Cup of Hockey in 1996, he coached the U.S. to a silver medal at the 2010 Olympic Winter Games, and capped his brilliant international coaching career in style, leading the U.S. National Junior Team to a bronze medal at the 2016 IIHF World Junior Championship. Over the course of his distinguished career, Wilson has been a proud supporter of USA Hockey and a key contributor to the growth of the game at home and abroad. “We’re starting to see real numbers in the NHL and you’re starting to see us being able to put teams together in the world championships where it’s difficult to field teams that can compete with the best teams in the world. That’s a real positive,” he said. And many of those volunteers will be here tonight to honor and celebrate the contributions of one of the most distinguished classes in USA Hockey history.